Well, this was a very bad idea because the neck opening wasn't large enough to support a cowl neck. It looked ridiculous, and I pretty much hated everything about the sweater at that point. So I pulled out my needles, folded the sweater up, slid it into a plastic bag, and moved on to the next project. 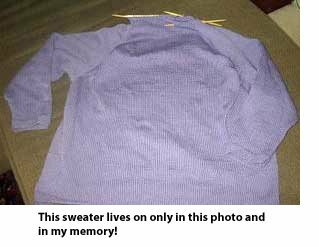 I recently came across that sweater, and I realized I was never going to wear it and that there were at least twelve skeins of perfectly good Cotton Classic just sitting there in a bag. So I took it out of the bag, tuned in a good movie, and unraveled the entire thing. 1. If you're going to change the neckline, plan for it early in the process. This was a raglan sweater and I needed a wide neckline for the cowl I wanted, so I would have needed to cast off all four pieces—two sleeves, a front, and a back—sooner than the original pattern called for in order to leave a wider area at the neck. 2. Be mindful of yarn joins when you're using a smooth yarn. Cotton Classic has impressive stitch definition (but it also shows imperfections), so be careful when you join a new ball—this project is where I learned to start a new ball at the beginning of a row instead of in the middle. When you add a new ball at the end or beginning of a row you can hide the ends—and that loose stitch that I always seem to get—in the seam. 3. 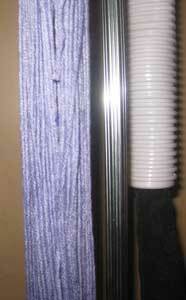 If you think a garment would hang better with some short rows added, you're probably right. See that extra fabric at the bust area on the front of the sweater? I added short rows to this pattern; another first for me. I have a dim memory of the short rows being too high on the chest the first time I tried them and having to rip down another inch before doing them again. The addition of the short rows made the sweater hang evenly in front and in back without coming up in the front, which happens to a lot of us bigger-busted gals. How Can I Possibly Re-Use This Pile of String? So. After I unraveled the sweater, I ended up with a pile of what looked like purple Top Ramen. What to do? I decided to wind the yarn into skeins and go from there. 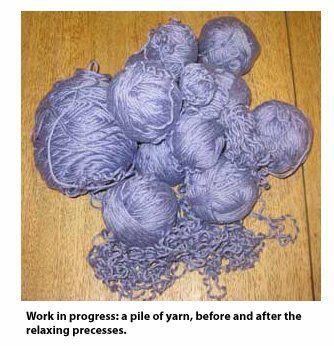 When I had several skeins, I tried a couple of methods to see what would work best for relaxing this yarn. 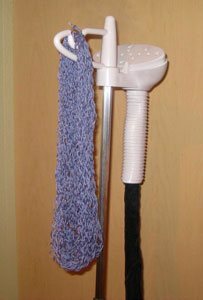 The first thing I tried was soaking a skein in a sink of lukewarm water, rolling it in a towel to get most of the water out, and letting it hang dry. That process worked, but it was a bit labor intensive since I had so many short lengths of yarn that I needed to deal with (I don't know why I had so many bits—I don't remember cutting the yarn that much!). 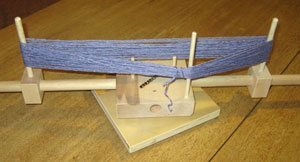 Here's the yarn on the swift. I put the pile on the floor and wound it slowly onto the swift. Ready for steaming. I hung a hanger on the bottom of the skein to add some weight and to give me something to hold onto while I was steaming. 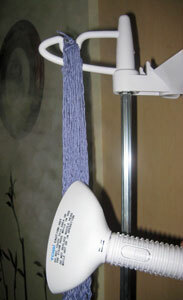 Steaming the yarn. The final product—good as new! And now a challenge: If you've knit something that you know you won't wear, don't let all of that good yarn just sit there! Grab the garment, get out your Knitting Daily TV series 400 DVDs, settle in, and start ripping! And while you're amassing piles of yarn ramen, think back about the process of knitting the sweater; what lessons did it teach you?